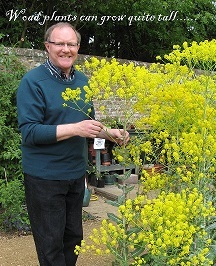 We are holding plant sales to raise funds for the garden on the last Tuesday of April, May and June. We would be grateful to have your support either in the form of custom or of donated plants. Please see events page for further details. Anticlockwise half turn A with d. Oh no! - that's not the way we do it in the Physic Garden. In this picture the gardeners are stripping the soaked Willow branches of their bark.This is then used as a summer plant stake for the tall herbs such as woad. Removal of the bark prevents the support from sprouting. In a new initiative Pauline and Sarah are making a feature of planted terracotta plants to add colour to the Garden. In C17 gardens, container-pots were often arranged in symmetrical patterns in parterres, placed on walls or set along terraces. 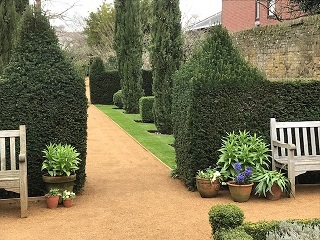 These were often planted with imported exotic half hardy plants which could be moved into orangeries during the winter. We are awaiting the return of our lemon trees which have been over wintering in a conservatory. On two of the coldest days this winter two valiant volunteers undertook to replace the rotten trellis work behind the walnut tree. The results may be seen in the photograph. The new fence, which is attractive in itself is also sufficiently robust to make an effective screen for the Hotbins behind. There are currently no plans to replant the vines on the trellis but these may be replaced with planted pots. When the Garden reopened visitors were able to experience the newly resurfaced paths and enjoy the colourful spring flowers which carpeted the orchard. 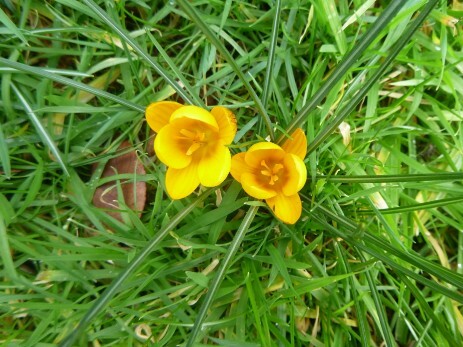 Snowdrops, crocuses and aconites were all doing their very best to dispel the winter blues. Hidden Rock hunters could also have been in luck as the photo demonstrates. Work on the paths is well under way. The top layer of the old paths is scraped off and removed leaving a solid base. Two inches of new gravel is then spead over this firm foundation. The gravel is then compressed making a raised centre to allow drainage. 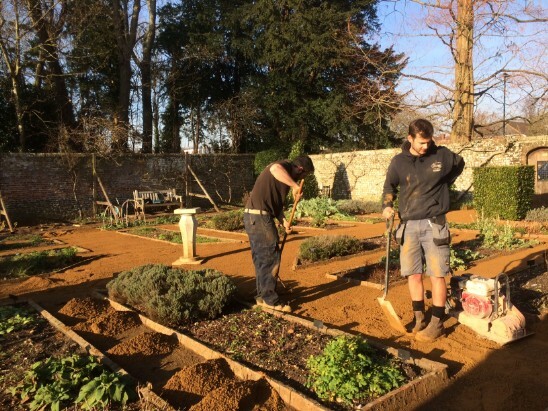 Once finished it is suggested that the paths should be allowed to cure giving the clay mixture time to set. 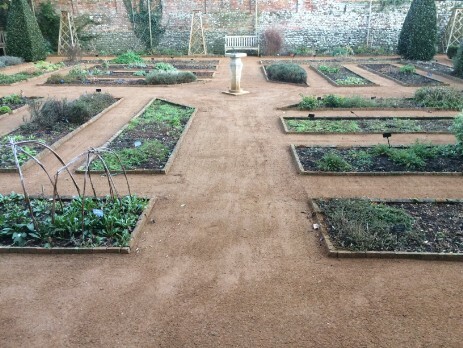 The Garden will therefore remain closed after the contractors have left to allow this process to complete. As many of you are probably aware it had been decided to resurface all the paths in the Garden. These have become very worn in places which is particularly evident in wet weather. A firm called Helyers of Fareham have been instructed to carry out the work which will take place in January. This will necessitate closing the garden for the month although the Meeting Room will still be available. 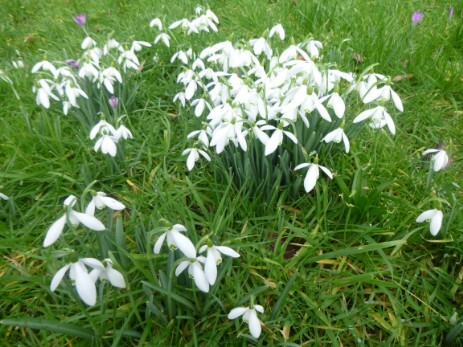 We apologise for any inconvenience this may cause but hope to open again to visitors in February with shiny new paths. 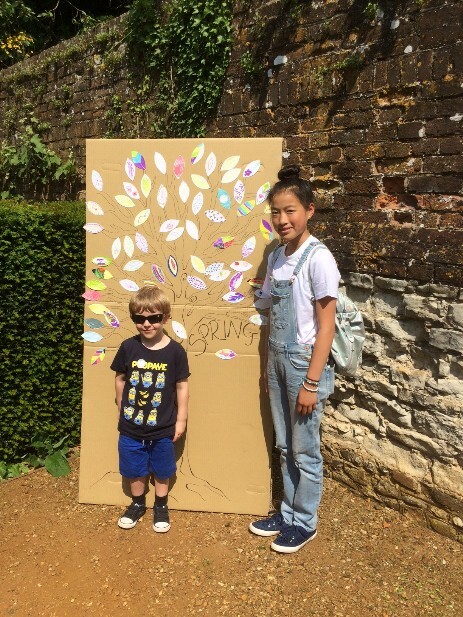 The half term holiday provided another opportunity for children to practice their artistic skills in the meeting room of the Physic Garden. 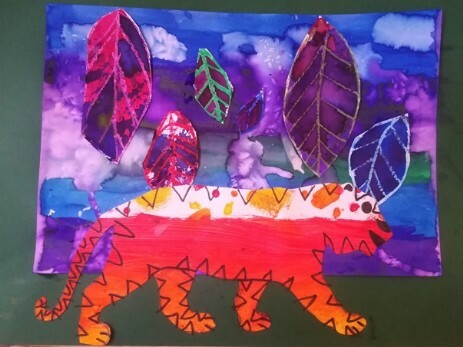 Vicki Ostersen returned, full of imagination, to provide inspiration for three sessions which were entittled 'Jungle! All about paint', 'My Street. Drawing and Chalk' and 'Mosaic'. 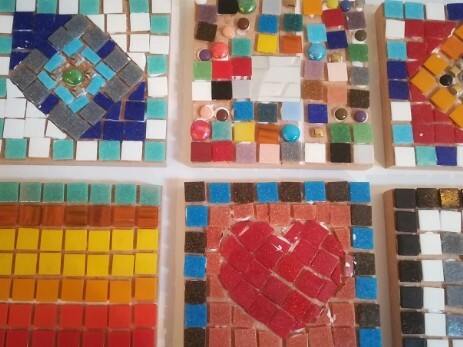 As the titles suggest there was plenty of choice in the use of different materials and the decisions as to whether to work individually or collaboratively. Some stunning results were produced, as the photos below demonstrate, and there were lots of happy children and parents. The Physic Garden continues to be an excellent place for finding Hidden Rocks. Garden volunteers welcomed Lina as she helped sort out some of the woody prunings in Petersfield Physic Garden. 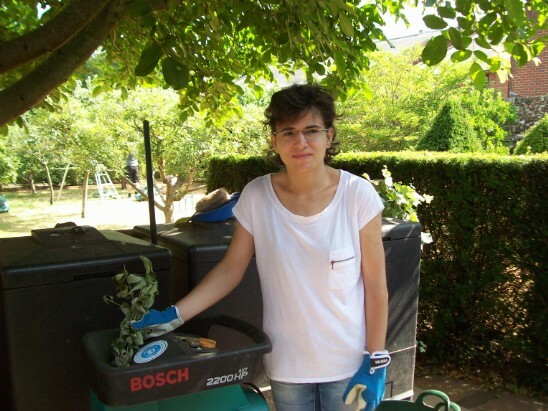 An Engineering student in her first year, Lina is French and lives close to Barentin, Petersfield’s twin town. Lina is staying with Joy Francis, a Physic Garden regular, who was delighted to hear that Lina is also fond of gardening. 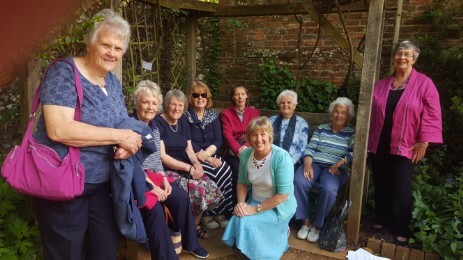 The group will benefit from her three week stay in Petersfield. 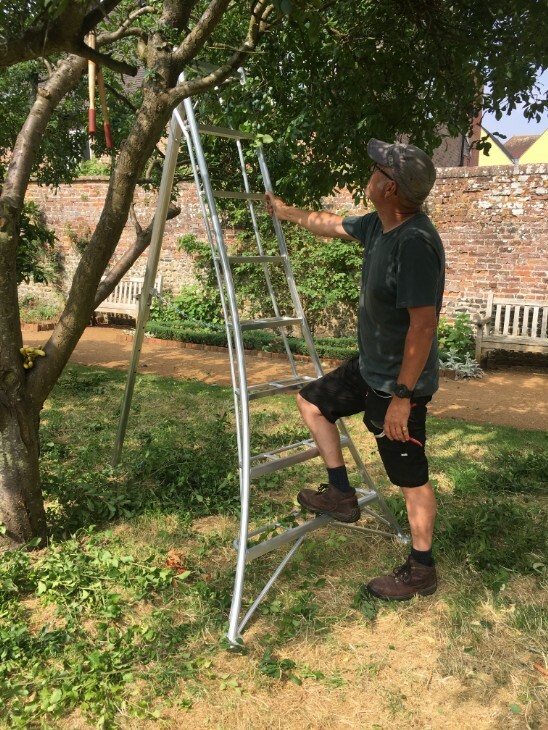 Volunteers at Petersfield Physics Garden were amazed when our gardener, John Wade-Palmer, arrived with his new state-of-the-art tripod ladder, to prune and tidy the damson. The ladder, a Niwacki, is made in Japan and has been in use for many years to deal with bamboo cutting and olive tree pruning, as well as orchard use. Its incredibly stable and versatile design makes pruning the trees in the Physic Garden much safer than with our conventional ladders. Being hollow aluminium, the ladder is light to carry around and packs down into a small space. Our team of garden volunteers will be queueing up to have a turn on it! Sometimes in dull moments when there are no visitors the garden stewards find that time can go slowly. Not so for Pauline Elkins. In spare moments she applies her drawing talents to committing plants and flowers from the Garden to paper. 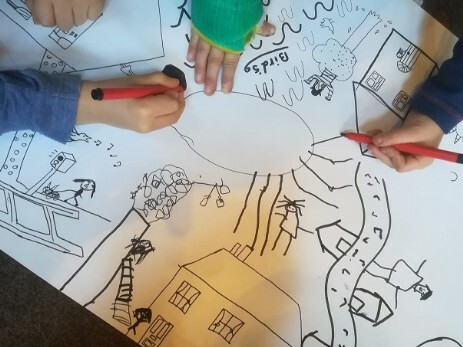 She usually has her sketch pad and pencil to hand and is always eager to record a huge variety of interesting subjects. 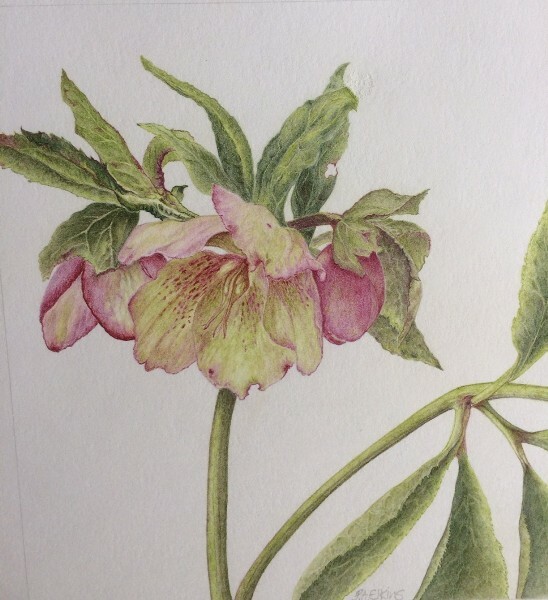 Pauline's skills are demonstrated in the charming picture of the Hellebore which she created using a large number of coloured pencils. 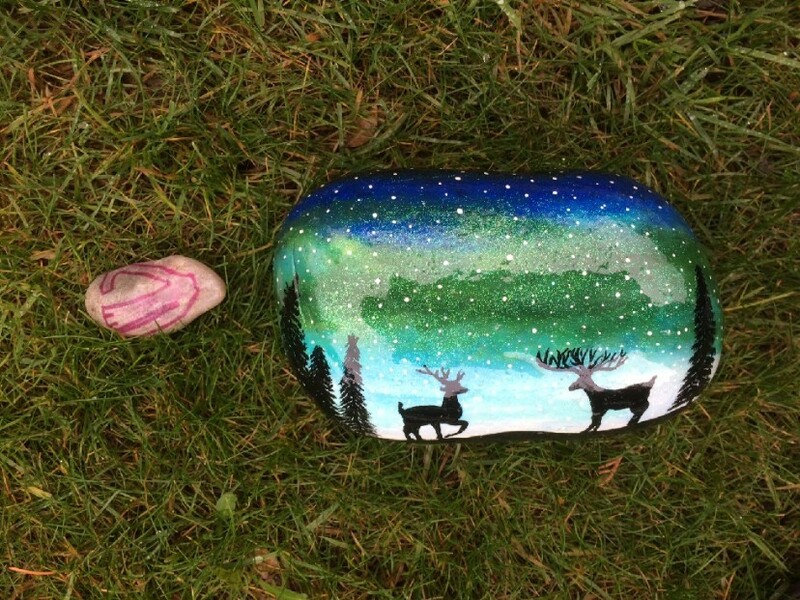 She is hoping to exhibit some of her work at the Autumn show of Petersfield Arts and Crafts in the Physic Garden. 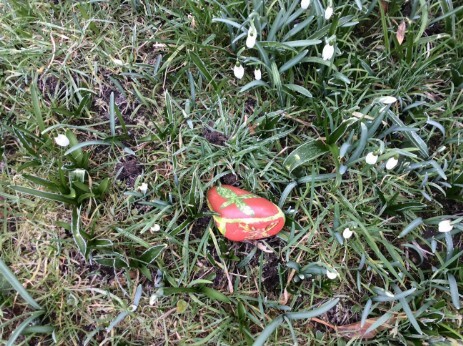 One May morning gardeners were greeted by this sad sight. 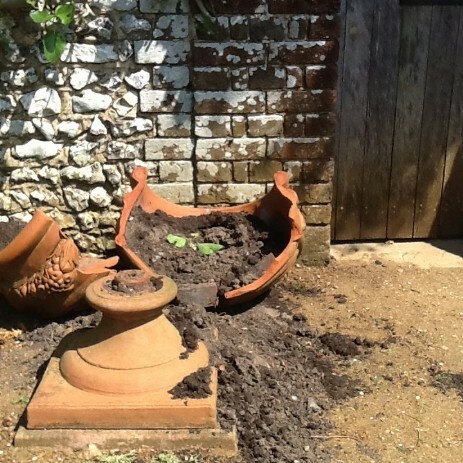 An urn which had stood by the back gate for many years was found shattered with no known explanation. 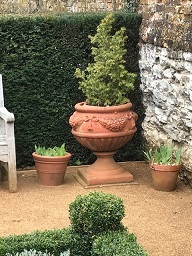 The urn which was a gift to the Garden was made by Whichford Pottery and was a copy of that designed for the National Trust for Ham House near London. It was based on existing stone gate finials dating from about 1680 and was the sort of exuberant design which would have been appearing in English gardens at the time. 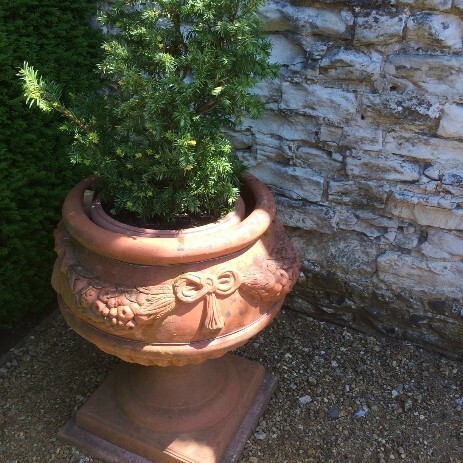 The tale thankfully has a happy ending as the Physic Garden is fortunate in having a very gifted volunteer in Paul who was able to collect all the broken pieces together and restore the urn to its former state. 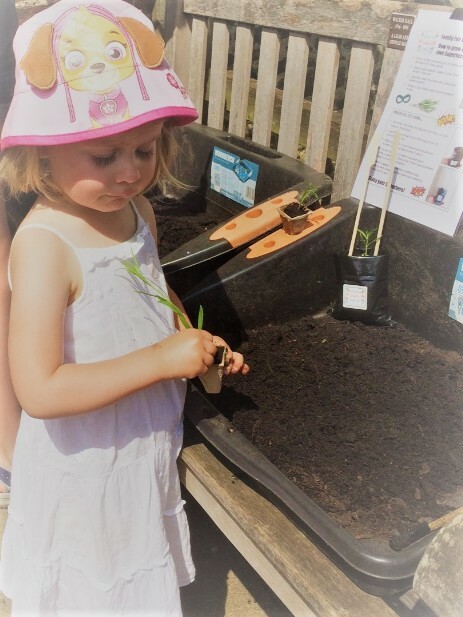 On Bank Holiday Monday the Physic Garden was full of happiness and children like never before. 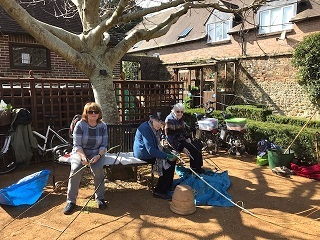 In brilliant sunshine, outdoor entertainments filled the Garden. 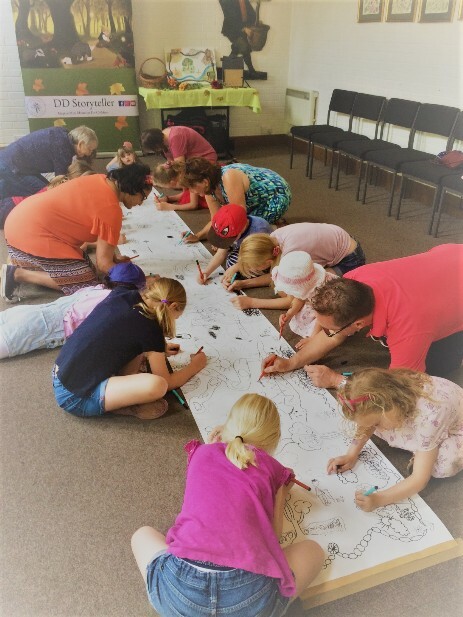 Under the direction of Vicki (art), Dawn (spontaneous storytelling) and Louise (plants) the children enjoyed collaborative drawing, mini mysteries and simple gardening including the search for scented herbs. 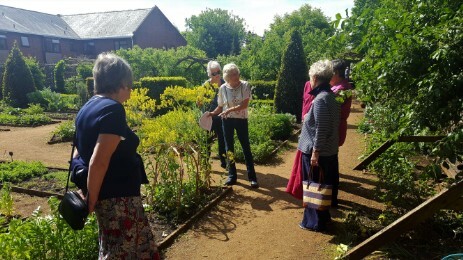 The pictures show members of the Bidbury Mead WI, who were given a guided tour of the Garden by Garden Manager, Jenny Hill.They were shown many of the herbs grown in the Garden and told of the ways in which they were used medicinally in the 17th Century.Stories of the associated myths and folk lore also entertained the group. Liquidamber is a deciduous tree which is native to warm temperatures of North and Central America. It was so named by Linnaeus because of the tree's fragrant gum which exudes from the bark of the tree when wounded. 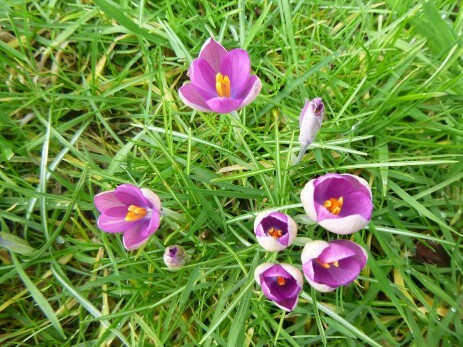 The species was introduced to England by John Banister in 1681 and planted in the palace gardens in Fulham. It is a popular ornamental tree cultivated for its distinctive foliage and intense autumn colours. 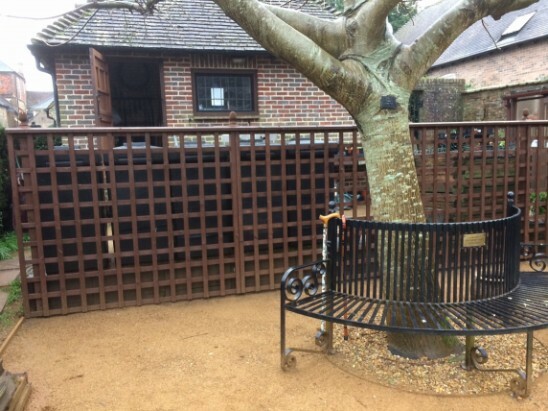 Visitors to the Physic Garden recently may have noticed a new tree had been planted alongside the bench on the East Wall.This is a Liquidambar tree and is a gift from the Twiddy family. 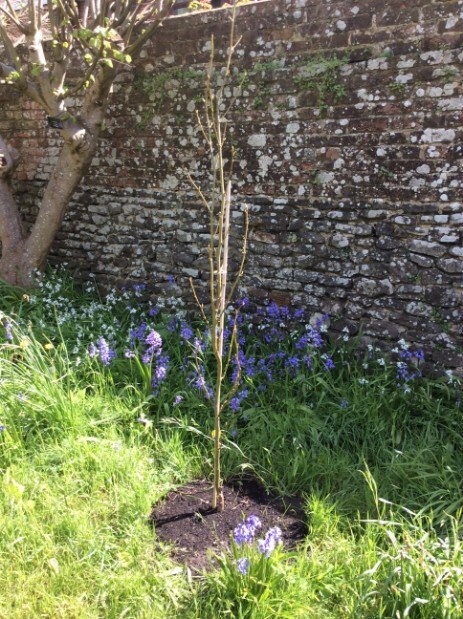 It has been planted by Sue and Alan in memory of their son George who spent many happy hours in the garden.